Many people complain of bumps on their piercings. While proper care usually keeps these from forming, sometimes a piercing gets a bump with the best of care. Identifying the bump and treating it can reduce pain, and help your piercing heal faster. Identify what type of bump you have. The most common bump on a healing piercing is a boil, or bacterial pocket. This occurs when trauma causes a small tear, and microbes enter the wound. Boils are often painful and red, and may secrete pus or blood. Another common bump is hypotrophic scarring. Cartilage piercings, especially all types of industrials, are prone to this type of scar. Hypotrophic scarring is a bump surrounding the exit hole, the same color as your skin. It may feel hard, but often are not painful. They are usually caused by jewelry putting pressure on the piercing, and the body responds by scarring. The most serious bump is a keloid. It's scar tissue that grows beyond the boundary of a piercing. Keloids are hard to treat, they often need surgical removal. Dark skinned people have a higher risk of keloid scars. Boils are the most common, and easiest to treat of al piercing bumps. Sea salt soaks should be done daily on any healing piercing. Mix 1/8 teaspoon of sea salt with warm water, and soak the piercing for 5-15 minutes a day. This will help treat and prevent bumps, by drawing the pus and foreign particles out of the wound. Rinse your piercing after soaking to remove excess salt. If sea salt soaks aren't reducing your bumps, try using chamomile tea bags as hot compresses. Dip the bag into warm water and hold against the piercing. Re-dip when the bag loses heat. Do this once or twice a day for 10 minutes. You can alternate tea bags and sea salt soaks. For stubborn bumps that resist sea salt and chamomile treatments, try using tea tree oil. Dilute one drop of aromatherapy grade tea tree essential oil into a shot glass. You can also use a skin friendly oil to dilute. Dap this on the bump twice a day with a cotton bud. Tea tree is a strong antiseptic, and will kill most germs. It's also very strong, and can dry skin, so use sparingly. Hypotrophic scarring is often due to pressure on a piercing. Changing your jewelry is usually the best move. If the scar is around a ring or other curved jewelry, switch to something straight, like a barbell. If it's on an industrial, put individual jewelry in each piercing. Consult your piercer for jewelry changes in unhealed piercings. Time and oil massages often improve scarring. If hypotrophic scars don't improve after some time, steroid injections and certain topical creams may help. Consult a doctor to see if this is an option. If your bumps looks like scar tissue, doesn't respond to the above treatments, and is getting bigger or goes beyond the piercing itself, it may be a keloid. Keloids are large, and often a darker color than the surrounding skin. See a doctor or dermatologist to determine this. Keloid may require surgical removal or steroid treatments. Be advised, however, occasionally keloid removal results in more scar tissue. If you know you are prone to keloids, you may want to rethink being pierced. For some body parts, sea salt soaks are difficult. Use cotton balls on hard to reach places, or try shot glasses or large bowls, depending on the body part. Make sure your salt solution is no saltier than tears. Too much salt will do more harm than good. A saline spray for piercings is a good idea for on-the-go treatment. They should not replace soaks, since the warm water helps draw things out of the piercing. Solutions also sit on skin, and can be drying. Don't overuse them. You can add a drop of tea tree into a salt soak for more germ fighting power. Always wash your hands before touching your piercings. Wash piercings once a day, and keep residue from hair products, soap, and lotions away from them. Antibacterial soap is a matter of personal choice. 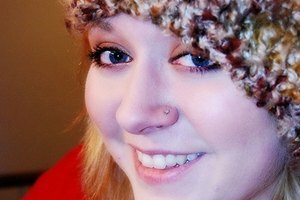 Many piercers prefer it, some advise against it. It's often best to use any gentle soap that your body is used to.